Here at Independence Homestead, a big part of being self-sufficient is being able to get through an emergency. In our area there was a huge storm on Friday night. While our homestead came through the storm just fine, over 200,000 people in our county were still without power 24 hours later. Plus several areas had water issues, where residents had to boil their water to make it drinkable. Luckily we didn’t have to boil our water, but the storm and its repercussions brought to mind how quickly even a developed area can be put in a hard place. One task George and I already had on our to do list was to bleach and store more drinking water. Our process for doing this is very simple, and it’s FREE! As we empty plastic juice and soda containers, we clean them out and save them. Then we fill them with filtered water. Finally, we added bleach. 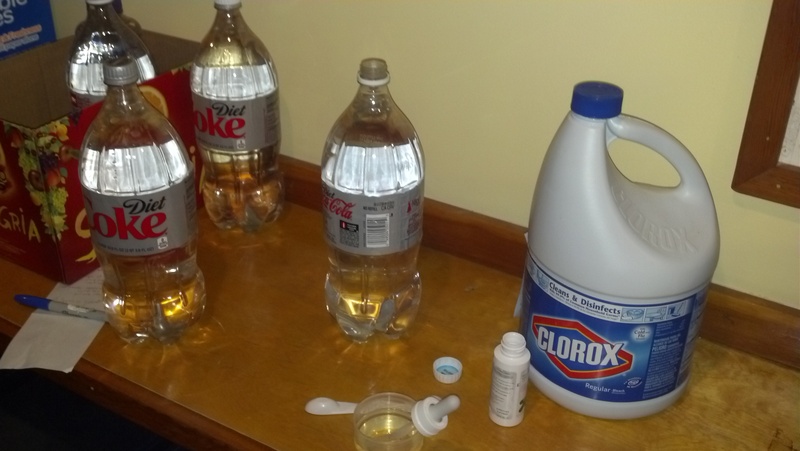 Adding bleach to water for storage. Water from municipal supplies is already treated and chlorinated to a certain extent, but according to online sources it’s recommended to add a bit more bleach when storing water long-term. The sources we found recommended 16 drops, or about 1/8 of a teaspoon, per gallon. Most of our containers were about 1/2 gallon, so we put 8 drops in each. Then we wrote the date on the bottle. With the bleach, the water should stay good for several years. So then we stored the jugs of water out of the way, and now we’re ready for a short-term interruption of our water supply. This increases our self-sufficiency in case of emergency.